e3 Diagnostics offers a wide variety of newborn hearing screening instruments that are fast, reliable, and easy to use. If you’re implementing a Universal Newborn Hearing Screening program or are just in need of a new instrument, browse our devices today to find the right fit for your unique needs! 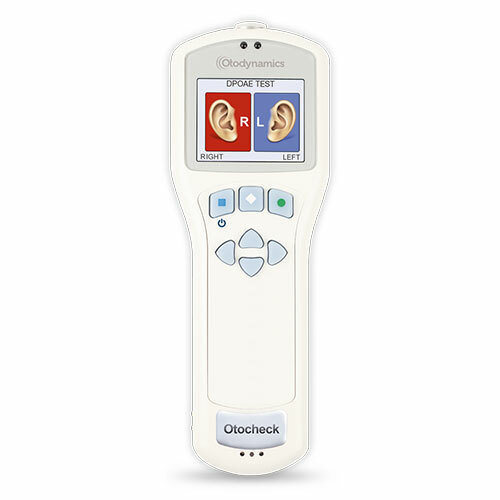 The Otocheck LE is an economical handheld OAE hearing screening instrument, designed for simplicity and applications that do not require electrical recording of patient details and results. With ‘one press and go function’, a result in seconds, minimal training required, its ready for any user. Added benefits of low cost consumables, long battery life and over 30years of OAE screening expertise easily make the Otocheck LE the most affordable and fastest solution for OAE screening.